RollingPlanters are "commercial" quality planters. There is a major quality construction difference for commercial versus residential applications. After reading our literature RollingPlanter hopes you have concluded the difference. If you still have questions, call us: 805.643.5902. RollingPlanters are priced for the professional designer and retailer in mind. 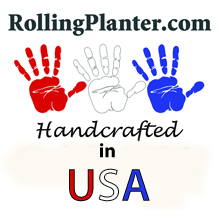 Professionals will understand the quality that is being offered by the RollingPlanter. Al prices are already discounted. We do discount for schools, large volume purchases and affiliates of certain professional trade organizations. (Proof of membership and affiliation is mandatory). RollingPlanter listed prices nevert include shipping. Some of our planters, namely our CAFE planters ship economically via UPS, United Parcel Service. others do not. Some planters of these can br purchase off this page, See selection below. Our shopping cart only allows for shipments to continental US addresses (residential and commercial). Others have to be shipped LTL, Less Than Truckload. An order form is provided for these. 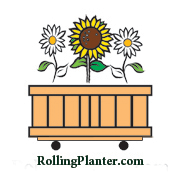 RollingPlanter requires a $650 minimum order for all LTL shipments. All RollingPlanters are shipped fully or near fully assembled. The majority of our RollingPlanters are shipped on large wooden pallets. The standard pallet has the dimensions of 40 x 48." A pallet can hold two or our largest planters M48s, 6 M24s or 18 of our smallest CAFE35. The RollingPlanters shipped on pallets are wrapped in protective wrap, strapped and loaded on large commercial tractor trailer trucks. Most RollingPlanters are shipped to accessible commercial loccations. These areas are warehouses, offices with office parks, stores in strip malls or any commercial location that has accessible door to a major street. Shipping to a verified accessible comercial location si more affordible. All other locations are called limited access locations. Limited access locations include but are not limited to the following: construction/mine sites, shows/fairs/carnivals, churches, hospitals, colleges, schools, farms, hotels, sites with extensive security processes and residences. Limited access have higher shipping rates. We require all to call prior to making an order to obtain a shipping rate based on the accessibilty of the shipping address. No order will not process any planter until the price of shipping has been clearly established and verified. Payment is processed is in full upon agreed total price- planters requested plus shipping costs. If you would like to order via phone, or still have questions call us: 805.643.5902. 16 x 37 x 25" commercial duty, with: lockable wheels, plumbed liner, fully assembled. 16 x 47 x 25" commercial duty, with: lockable wheels, plumbed liner, fully assembled. 16 x 55 x 25" Commercial duty, with: lockable wheels, plumbed liner, fully assembled. M24 UPS Special Made, Mobile Planter. 24 x 36 x 25" Commercial Duty Rolling Raise Bed Planter, with: lockable wheels, plumbed liner, fully assembled. M-CUBE-2.25 Mobile Tree Planter. 27 x 27" x 28" Commercial Duty Rolling Raise Bed Tree Planter, with: lockable wheels, plumbed liner, fully assembled. Irrigation Snorkel: Pipe channel pathway made with marine pipe fittings that penetrates and seals the bottom of the planter and allows a chase way for 1/2" irrigation hosing to be run to the planters surface. Undersurface cavity that is filled with water and able to release it into the soil. The natural capilary action of the soil delivers water to the plants roots. Water evaporates far less as it less exposed to the sun underground and even more below mulch. Water will last up to three weeks in the cavity. This system is great for people on the run. RolllingPlanters can be offered in 10 stain colors and finishes. Their is standard, no paint, oil or stain, just sanded wood. Oiled, the woood is oiled in a mixture of boric acid and Canola oil. 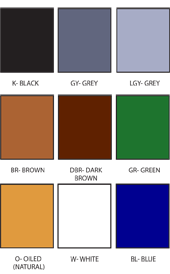 Black, Grey, Light Grey, White, Dark Blue, Light Brown, Dark Brown and Green stain. The stain is a mixture of mineral oxides, Canola oil and boric acid. All ingredients in the stain and oil are safe/non-toxic.